The Regulatory Affairs Professionals Society (RAPS) extends sincere congratulations to the 279 regulatory professionals who earned Regulatory Affairs Certification (RAC) during the autumn 2011 exam period for the RAC, the only post-academic professional certification for the healthcare product regulatory field. The exam and credential maintenance criteria is developed, managed and administered by the Regulatory Affairs Certification Board (RACB) and supported by RAPS. Since its inception in 1990, more than 7,000 individuals in 35 different countries have earned the RAC. Candidates for the RAC credential from around the world sat for one of the four versions of the exam in autumn of 2011. A complete list of the new RACs can be found online at http://www.raps.org/focus-online/news/news-article-view/article/1360/autumn-2011-rac-class.aspx. RAC-credentialed professionals are among the current and rising leaders in the regulatory profession. They work in all parts of the world and in many settings, including industry, government and academic organizations. 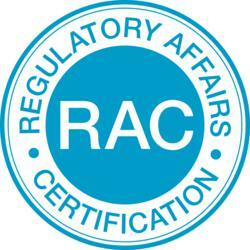 The RAC exam is intended for regulatory professionals with at least three to five years of regulatory experience. Four different RAC certifications are available: the RAC (US) covering US regulations, the RAC (EU) covering European regulations, the RAC (CAN) covering Canadian regulations and the RAC (General Scope), which covers general regulatory responsibilities and international standards. Registration for the autumn 2012 RAC exam period, 1 October–30 November, is currently open. More information is available online at http://www.RAPS.org/certification.aspx.